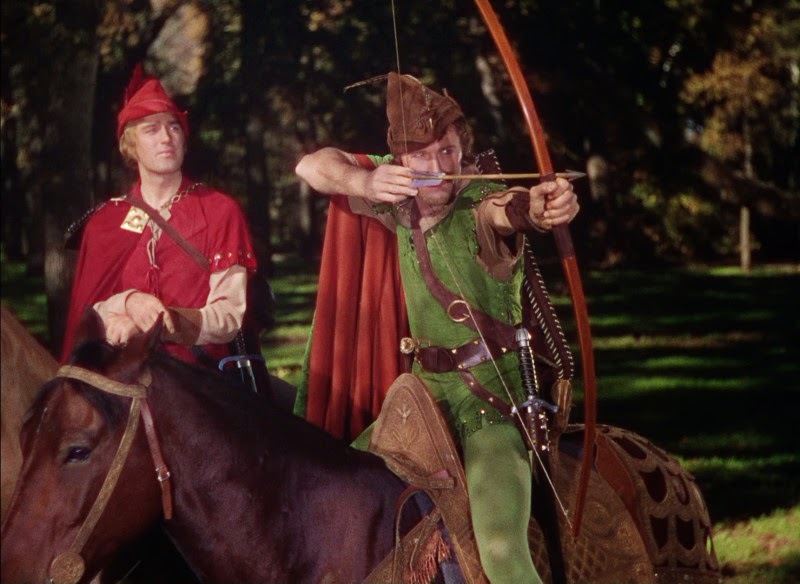 One of Hollywood's best swashbuckling adventures and the first in glorious Technicolor, The Adventures Of Robin Hood is a non-stop thrill fest with plenty of romance, swordplay, archery stunts and general joviality. With King Richard the Lionheart held hostage in Austria, his evil brother Prince John (Claude Rains) makes his move to seize power in England by fermenting the divide between Normans and Saxons, helped by Sir Guy of Gisbourne (Basil Rathbone). The charismatic Sir Robin of Locksley (Errol Flynn), an ace archer and soon to be known as Robin Hood, is loyal to Richard and launches a rebellion, using the dense Sherwood Forest in Nottingham as his base. Robin collects a merry band of men including Will Scarlett (Patric Knowles), Friar Tuck (Eugene Pallette) and Little John (Alan Hale Sr.), and they take to ambushing Prince John's tax convoys, stealing from the rich and giving to the poor. 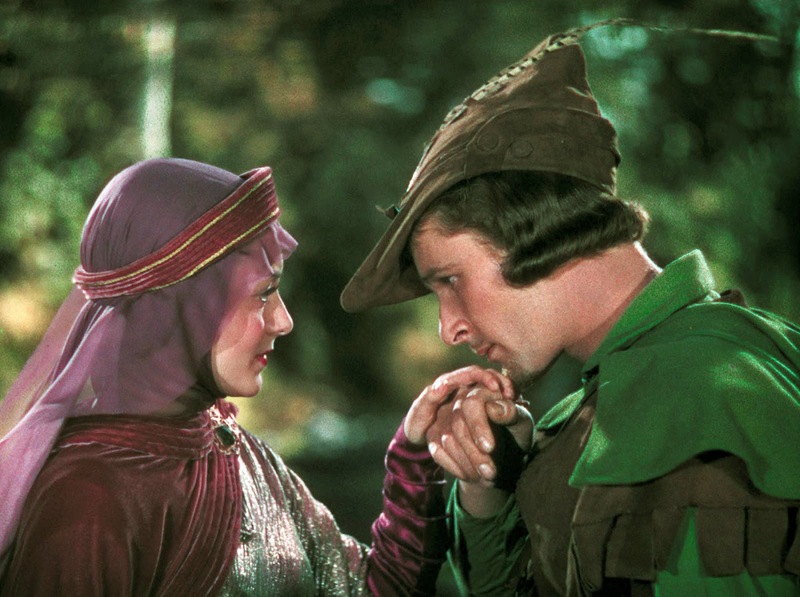 As he mercilessly taunts his enemies, Robin meets Maid Marian (Olivia de Havilland), a beautiful member of the royal court. Marion and Robin fall in love, after she learns about his cause and believes it to be just. When Robin competes in an archery tournament and is finally captured by his enemies, Marion has to find a way to save him, but her betrayal of John lands her in trouble. As Prince John gets ever closer to the throne, Robin has to return the favour and save Marion, while the unexpected return of a King again threatens to tilt the balance of power. Directed by Michael Curtiz and William Keighley for Warner Bros., The Adventures Of Robin Hood is a dazzling kaleidoscope of vivid colours, lively characters and lavish sets. Packed into 102 minutes, the film moves at an agile pace, finding action set-pieces at regular intervals and still taking the time to recount an involving and character-rich story of revolution and romance. The characters are admittedly coloured in pretty basic black or white, either all good or all bad, and some of the combat scenes, particularly a major ambush in the forest, are stiffly staged by modern standards. But the film rides Errol Flynn's irresistible magnetism through any rough spots, and the fluid cinematography makes the most of the expansive sets. The final sword fight between Robin and Sir Guy is brilliantly choreographed and oozes energetic athleticism, setting the gold standard for climactic duels. At his commercial peak, Flynn makes for a dashing Robin Hood, filled with confidence and deploying a mischievous grin and loud laugh to rally support and woo Marion. In relative terms Olivia de Havilland gets the most complex role, as Maid Marion is the only character faced with choices and divided loyalties. de Havilland revived her flagging career by giving Marion plenty of moxie, transitioning from a sharp tongued ally of the evil plotters to a secret weapon for the revolutionaries. This was de Havilland's third teaming with Flynn, and their natural on-screen chemistry and the film's success launched a further five collaborations. The supporting cast members have plenty of fun, Basil Rathbone and Claude Rains creating a worthy one-two punch of evil as they plot their takeover of the crown. They are backed by the likes of Montagu Love as the Bishop of the Black Canons, while Ian Hunter makes a late but crucial intervention. Hundreds of extras populate many of the scenes, to enliven sumptuous royal feasts, large scale forest battles and bring to life the villages and taverns of twelfth century England. The Adventures Of Robin Hood is one of modern Hollywood's crucial early milestones, a grand action-packed and fast-paced adventure with a dashing hero and a damsel in distress, the perfect template for ridiculously enjoyable fun.